The powerful, edge-driven fabric soft-dome tweeter design in the 3/4-inch (19-millimeter) Infinity REF-075tx component tweeter features greater power handling and lower distortion than conventional tweeters of similar size. These enhanced performance characteristics allow a richer level of detail in high frequencies and, in particular, vocal clarity that is lifelike because of the improved radiating patterns and power handling in combination with the included passive filter network. The Infinity REF-075tx component tweeter includes the I-Mount tweeter-mounting system, which allows easy flush mounting or surface mounting, giving you more installation options. In addition, the speaker includes a special Starfish bracket system that allows you to mount the tweeter in a factory dash or door speaker location originally intended for a larger midrange driver – up to 3-1/2 inches (87 millimeters) – and still easily install it behind the factory grille. The Infinity REF-075tx component tweeter features a dedicated outboard passive crossover network to filter and protect the tweeter. This feature will help the tweeter perform well over the long term. A speaker featuring high sensitivity allows a wider range of power to have definitively high volume levels without overdriving the audio system. Featuring sensitivity of 93 decibels at 2.83 volts / 1 meter, the REF-075tx tweeters achieve excellent volume and musicality with as little as 5 watts RMS. These numbers mean simply great performance overall with even very moderate power driving the speakers. It makes the REF-075tx tweeters an ideal replacement for premium factory-installed systems where there are already component locations with dedicated tweeters as well as for any aftermarket installation, including adding an extra tweeter to lift and direct the sound to the listener’s ears. 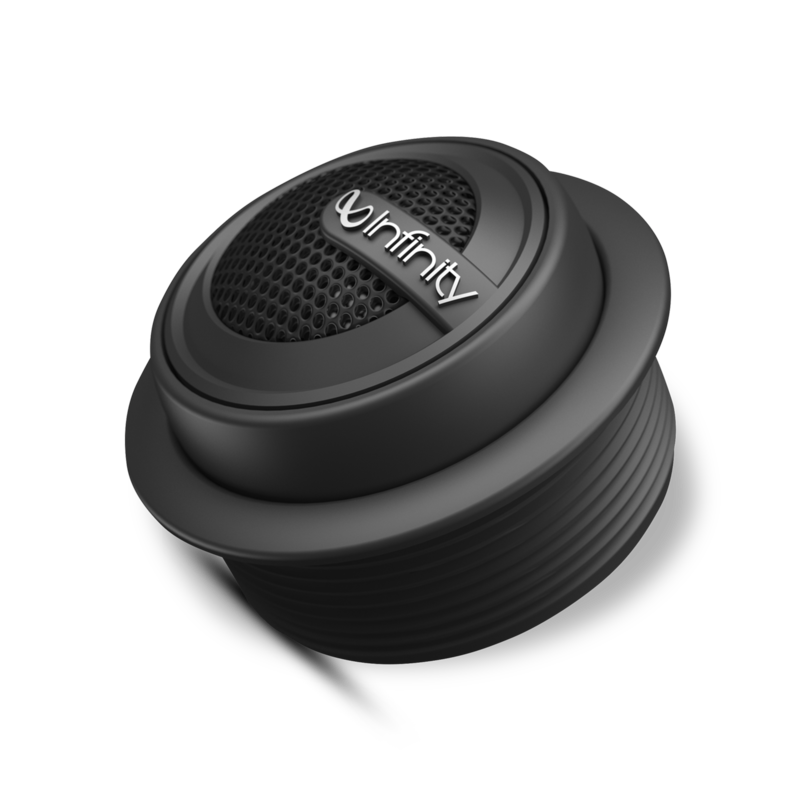 Infinity Reference X high-fidelity tweeters feature 3-ohm voice coils to ensure ideal performance, whether you use the speakers as an upgrade to a factory-installed audio system or connect them to aftermarket head units or amplifiers. By ensuring the safe 3-ohm load along with associated wiring and connections, the power delivered to the tweeters is right on target with peak system performance and reliability, which is how the speakers’ true 4-ohm technology works. Get all the power you’ve paid for and enjoy effortless, high-quality sound in your car. The Infinity REF-075tx component tweeters are part of a complete range of automotive speakers that fit factory-installed locations in virtually every vehicle on the road today, including premium audio systems that already have factory-installed component tweeters. These tweeters still provide a significant improvement in those cases. All Reference X speakers leverage the extensive Infinity pedigree of audio and engineering innovations and deliver remarkable sound in your car. You’re going to love the sound from these speakers. It’s a small tweeter with a big job. 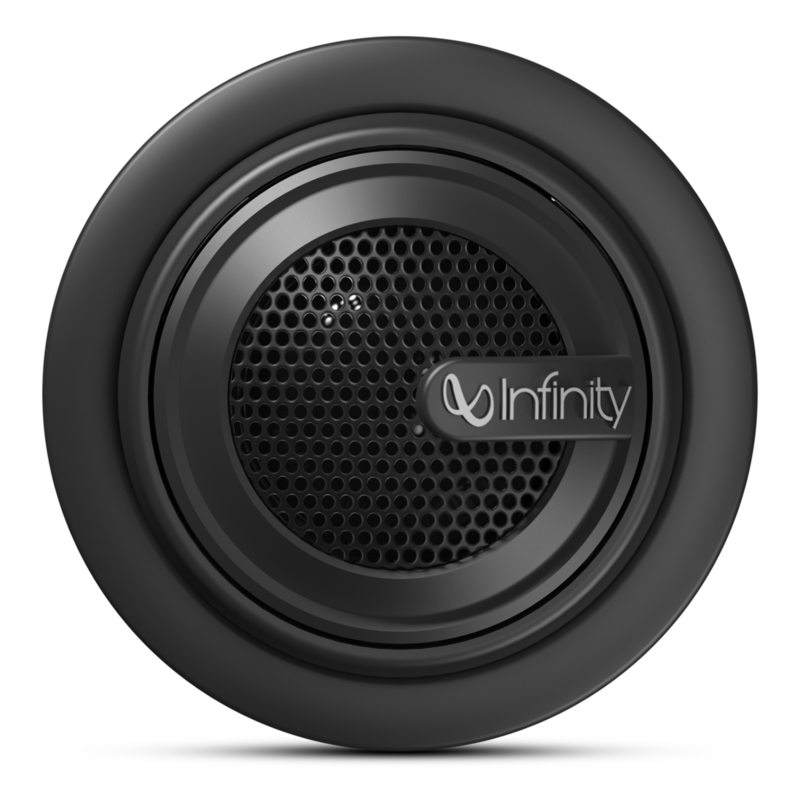 The Infinity® brand is known for a heritage dedicated to great sound reproduction. Whether it’s the lowest notes of a bass guitar, the wide bandwidth of a piano or the cymbal crash in the highest frequency ranges, the Infinity Reference X Series of automotive speakers has it covered. The Reference X REF-075tx 3/4-inch (19-millimeter) component tweeters make an ideal upgrade tweeter for systems that are lacking in good high-frequency response or systems where the position of the sound seems very low in the front of the car. They perform equally well driven from a head unit or an amplifier. Innovative features such as edge-driven fabric soft-dome diaphragms, dedicated passive crossovers and extended frequency response above 20kHz ensure that you’ll be impressed from the start. I-Mount™ (U.S. patent number 5,859, 917) and Starfish™ tweeter-mounting systems are included for surface mounting, flush mounting or behind-the-factory-grille mounting. Rigorous Infinity testing and voicing procedures ensure that the added high-frequency enhancement from these tweeters will make a difference to your system. With a Reference X Series speaker available in virtually any factory size, every vehicle can experience the high fidelity and great value performance of these innovative automotive speakers. Your car’s sound system will transform when you upgrade it to Infinity Reference X Series speakers. You’re going to love these speakers. Reference 075tx is rated 5.0 out of 5 by 1. Rated 5 out of 5 by johnny from thank you thanks for finding these tweeter for me. I noticed that you only have one pair in stock if you can find a another pair I would buy them too.